So many exclusive lines and niche brands popped up last year – Chanel’s Exclusives, Tom Ford Private Collection, L’État Libre d’Orange, and so forth – that I admit I turned up my nose on Kilian Hennessy’s L’œuvre noire. 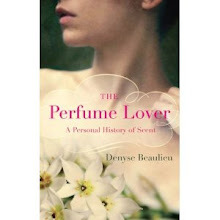 The perfumes were subtitled as though they weren’t able to choose between two equally provocative and slightly cheesy names ((Love/ Don’t Be shy ; Beyond Love/ Prohibited ; Liaisons Dangereuses/ Typical Me ; Cruel Intentions/Tempt Me ; A Taste of Heaven/ Absinthe Verte ; Straight to Heaven/White Cristal). The marketing prose definitely veered towards the purple spectre, summoning exalted cultural references from Faust to Freud and Byron to Baudelaire. Pschaw. The purple prose has now been pulled from the brand’s website, which shows that the people at By Kilian may have been paying attention to snarky remarks from the perfumed blogosphere. 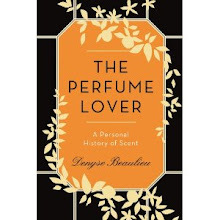 So I decided to ignore my inverted snobbery, knowing that many of them had been composed by Calice Becker, who is no slouch (J’adore, Donna Karan Gold, Lancôme’s re-edition of Cuir, as well as Luca Turin’s beloved Tommy Girl and Beyond Paradise). A sweet, enthusiastic and knowledgeable S.A. from the Bon Marché counter convinced me to give them a try, and showered me with samples. By Kilian’s tuberose wafted up from a scented strip for at least a week next to my keyboard, tempting me to try it first. I haven’t regretted it. How many tuberoses does a girl need? And how many ways can tuberose be presented? Beyond Love is different enough from Fracas, Carnal Flower and Tubéreuse Criminelle to consider adding it to my collection ASAP. Its aesthetics are distinct, veering on the hyper-realist. Instead of emphasizing the weird facets of tuberose absolute, as in the Serge Lutens, the tuberose itself is re-created with absolute, concreta and reconstituted accords (green and petal notes, according to the site, which unusually reveals a large part of the formula), and with a distinctly natural-smelling Egyptian jasmine absolute. I don’t know if this fragrance goes beyond love, but if definitely goes beyond the options taken by its tuberose-y sisters. This is a high definition, digital rendition of the flower, seen from so close that all its details are amplified, more precise than in nature (according to Luca Turin, it is the most faithful to the actual flower). An extreme slow-motion plunge into the very heart of the flower, whose buttery facet is reinforced by a coconut note, slightly lifted by a green accord, enriched by a musc and sclary sage (a vegetal substitute of ambergris) base. This is a tuberose crème, almost edible, a bit animalic, almost indecently exposed. It makes me want to roll naked in it. I am way behind the wave of new releases so I haven't tried this yet. I wish I lived where tuberose would grow wild. Have you ever seen them in the ground? Yes I have, in the south of Spain and in Morroco... They're not quite as common as jasmine, but you see them in gardens. This Beyond Love comes pretty close to them. This sounds marvelous. I am a huge fan of tuberose in all its forms, so I am sure I would love this. But why are Kilian's perfumes so expensive? 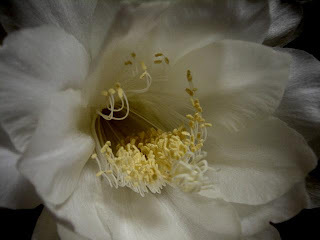 Most spectacular-smelling flowers are fairly unassuming, don't you find? While the big bright tropical blossoms are practically scentless... To each its reproductive strategy, I guess. As for By Kilian's prices, they're pretty much part of that upward spiral in niche perfumery. But once you've purchased the bottle and box with the 50 ml, the refills are much less expensive. Yes, I suppose with a scent so powerful and beautiful, there is no need for bright colors. Isn't nature amazing?